When we are tempted to fear the world that our children are growing up in, let us remind our hearts that God is bigger than any problem we (or our kids!) will ever face! And let us be more prayerful than fearful. Let us be prayer warrior mamas for our knights in training. Praying God’s Word has transformed my prayer life. If you want to read more about this way of praying, you can subscribe to my blog for a free ebook guide on how to Pray the Scriptures. Here are 10 verses that we can pray over our sons, each one correlates with one of the “codes of honor” mentioned in the book Knights in Training. Prayer: Oh Lord, grant me the grace to love you more and more each day. May my knight in training learn what it means to love you with all of his heart, soul and strength. Help my husband and I to be diligent teachers and doers of the Word in our home, when we sit at home, when we are driving around town and when we go to sleep at night. May your Word and Your love and Your sacrifice ever be on the forefront of our minds and hearts. Only by Your grace and for Your glory! Prayer: Lord, grow in my son a heart that delights in obedience. May he know, all the days of his life, what is right and good. May he always follow Your path and when he strays, draw him back to Yourself. Prayer: Lord, You have shown us what is good. You have shown my son what is good and what You require of him. Help him to do justice, love kindness and walk humbly with You all the days of his life. Prayer: Father God, may my son learn to defend the helpless, to defend and build up the oppressed, to bring justice to the fatherless and plead the widow’s cause. Grow in my son a heart of compassion for the needy around him. Give him the courage to share your love without fear. Prayer: Lord, grow in my son a heart of honor not only for those in authority in his life, but for all men and women everywhere. May he always show respect and honor to the women you place in his life. Prayer: Lord, You have said we will be blessed when we choose to be peacemakers. Grow in my son a heart that desires peace above being right. Convict his heart when his motives aren’t pure and he wants to pick a fight with those around him. Give him a heart of peace and humility in all things. Prayer: Father God, give my son courage to speak truth. And give him the wisdom to speak the truth in love. Grow him up in You, Lord. Prayer: God, Your light dawns in the darkness for those who live upright lives. We desire to be the light of the world to this lost and dying world we live in. May my son be gracious, merciful and righteous. You have told us that it will go well for the man who deals generously and that is our heart’s desire for our knights in training. Make them generous to all they come into contact with and in every situation they face. May he always conduct his affairs with justice. Prayer: Lord, may my son persevere in looking to You and Your Word, which brings freedom, and may he persevere. May he not be a hearer of the word alone, but also a doer who acts. We know that he will be blessed in the process. Prayer: Lord, may my son be a hard worker. May he know that you created him to work. Remind him that he works for You and that he will receive the beautiful inheritance you have for him as a reward. May my knight in training serve you all the days of his life. 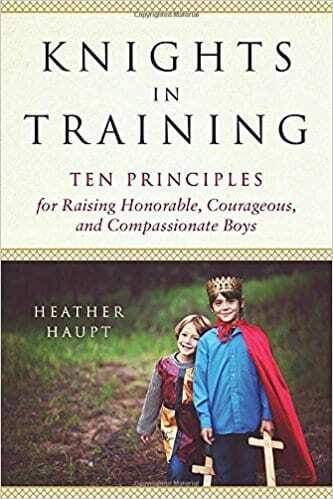 My friend Heather Haupt has written a fabulous book for moms of boys and it releases TODAY. 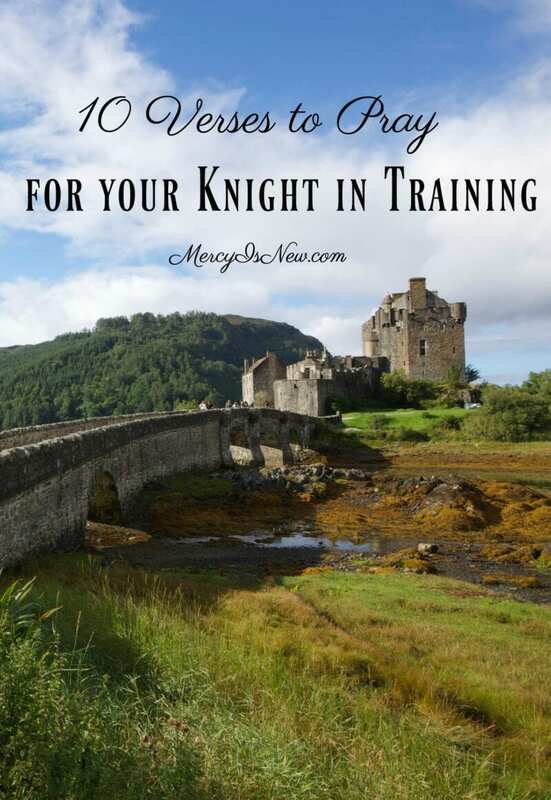 This book, Knights in Training, has 10 principles for raising our modern day knights to be honorable, courageous and compassionate.